The Equality Festival events planned for this weekend in Lviv have been disrupted and the activists effectively – and with violence – driven out of the city. 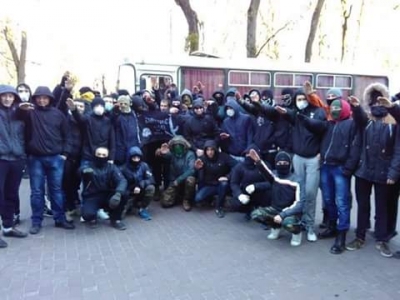 The police did not detain any of the young far-right thugs in masks who first harassed activists, then surrounded the hotel and attacked a coach with Equality Festival activists. The LGBT initiative Equality Festival had planned an Equality ‘Quest’ on March 19, as part of various anti-discrimination, pro-tolerance events over the weekend. The quest was to go around places linked with ideals of equality and freedom within the city. During the early hours of Saturday morning, the Lviv District Administrative Court passed a ruling banning all events in the area where the Equality Festival quest had been planned. The pretext was depressingly familiar. The Sokol nationalist organization had informed that it would be holding an event – almost certainly a counter-demonstration – and the Mayor’s Office asked for all events on the square outside the Opera Theatre to be banned. The European Court of Human Rights has on a number of occasions found that the likelihood of counter-events does not justify restricting citizens right to peaceful assembly. The regional police also asked for the ban, although it is they who are obliged to protect all citizens exercising their right to gather. It would be worth investigating the police’s role in this debacle. The Equality Festival’s events inside the Dniestr Hotel (initially not even publicly named for security results) were guarded by men from a private security company. According to Olena Shevchenko, one of the Festival organizers, they were forced to seek private security as there was no possibility of getting police guards. There seems to have been resistance from a number of quarters to the planned event, including from the Lviv Eparchy of the Ukrainian Orthodox Church under the Moscow Patriarchate. It was probably unfortunate timing that the festival was planned during Lent, however Bishop Filaret’s strong language about ‘sinners’ makes it clear that his objections were not linked only to the time chosen. Having been forced to give up street events, the organizers hoped to at least hold the exhibition of anti-discrimination posters, film viewings and a literary evening. The original venue had apparently refused to hold the event, giving threats as the reason, while the ‘Lviv’ Hotel is reported to have actually refused rooms to 25 of the organizers who had booked in advance. The activists were basically barricaded in the hotel because of the far-right thugs outside. Then within hours of the Festival beginning, the hotel had to be evacuated due to a bomb alert. At that point the police got the activists into a coach but do not appear to have made any attempt to detain the thugs who hurled fire crackers and stones at the coach. Fortunately nobody was hurt, and the activists have now safely left the city. The police have now announced that a criminal investigation is underway over the false bomb alert. There is no mention of any criminal investigation into the violence outside the hotel. A probe into the behaviour of the Lviv city authorities and the police would also seem required.